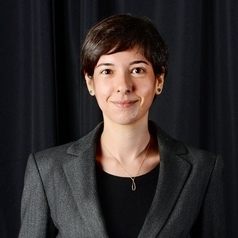 Sibel Oktay's research focuses on the foreign policy decision-making and behavior of coalition governments, primarily in Europe. Other research interests include political leadership and voting behavior within the context of democratic foreign policy, as well as Turkish-EU relations. Her work employs qualitative and quantitative methodologies, particularly comparative case studies, events data and content analysis. Oktay received her Ph.D. and M.A. in Political Science from the Maxwell School of Citizenship and Public Affairs at Syracuse University. She also holds an M.A. in Political Science and a B.A. in Social and Political Sciences from Sabanci University in Istanbul, Turkey. She was a visiting pre-doctoral fellow at Northwestern University’s Buffett Center for International and Comparative Studies between 2012 and 2014. Her work has appeared or is forthcoming in the Journal of European Public Policy and European Political Science. She is the 2013 winner of the Foreign Policy Analysis Section’s Alexander George Award and has been serving for the section as an officer-at-large since 2015.